OUTFRONT Media Inc. (NYSE: OUT) announced this week a campaign for Dogology, Inc. , a New York city based virtual dog training startup, that showcases the ability to use augmented reality in out-of-home campaigns, along with out-of-home and mobile advertising creative developed by OUTFRONT’s in-house creative boutique, OUTFRONT Studios. Between December 25, 2017 and January 12, 2018, OUTFRONT’s out-of-home displays and the OUTFRONT Mobile Network have prompted consumers in New York and Atlanta to download Dogology’s mobile app on the company’s website. Once downloaded, the Dogology mobile app invited users to engage with nearby sidewalk art, billboard or subway creative, which prompted in-app augmented reality dogs to interact with users and lead them to Dogology’s website where they could learn about science-based dog or puppy training and book virtual training appointments with Dogology. The combined mobile and out-of-home campaign ran in New York City on the subway, digital urban panels, and in Times Square, as well as in Atlanta’s northern suburbs with high density dog ownership. 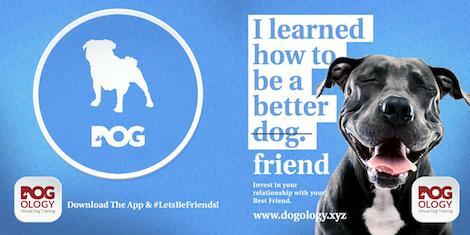 According to internal analytics provided by Dogology, this hybrid campaign drove an increase in direct website visits and sessions per user, mobile app downloads and augmented reality engagements, live chat sessions on the website and in the mobile app, as well as an increase in users who purchased virtual dog training from the company. Dogology evolved from the intersection of science-based dog behavior and technology. Based in New York City, the company’s professional dog trainers are at the cutting edge of both. Dogology trains dogs virtually. All kinds of dogs. From puppies to dogs who have lived long and happy lives. Dogologists use positive, science-based methods to help an owner and the dog create a stronger bond.